A tale of magic, mystery and fairy-tale fantasy awaits in Angel Princess. 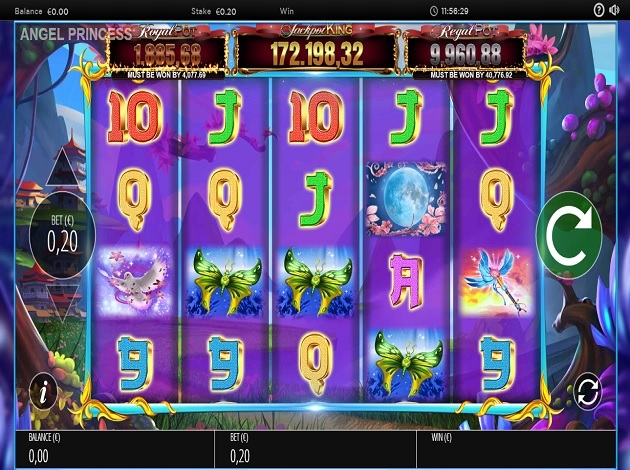 Powered by the folks at Blueprint Gaming, Angel Princess is a 5-reel, 40-payline slot with action-packed gameplay and a solid string of special features. Angel Princess has a massive progressive jackpot to play for and many points of appeal and interest and that are well worth checking out. Enchanted Spin feature – Anything from 1 to 20 additional Angel Princess symbols make their way onto the reels, which become matching symbols to create a winning combination. Magical Wilds feature – The player wins a free spin with a whole bunch of extra wilds added to the reels. Super Bonus Reels feature – At least two (though usually more) bonus symbols are added to the reels, massively increasing your chance of getting into the bonus rounds listed below. As a medium-variance slot, you won’t be waiting around long for one or more of these features to kick in. You’ll need at least three bonus symbols in any position on the reels to trigger the game’s main feature – Enchanted Free Spins. Three of these bonus symbols will reward you with five Enchanted Free Spins, four bonus symbols provide five Super Free Spins and five bonus symbols on the reels return five Epic Free Spins. The difference being the top prize you’ll be playing for – the Bonus, Super Bonus or Epic Bonus. Angel Princess also provides the opportunity to gamble for the chance to climb up the paytable. The good news being that if you lose, you won’t lose everything, you’ll still be paid a consolation prize to ensure you don’t leave empty-handed. During the free spins bonus features, the Angel Princess herself can make an appearance and transform the in-play symbols. It’s also possible to re-trigger the free spins, with a maximum of 10 spins up for grabs. Angel Princess is part of the Jackpot King network. To gain access to the top prizes on offer, you first need to land five Jackpot King symbols in a row across the five reels. After which, you’ll be transported to a new set of reels where you’ll collect crowns for a spin of the jackpot wheel. During normal play, the maximum prize payout is worth 500 coins, which is payable for landing five Heart Wild symbols in an active payline. The Full Moon symbol pays up to 250 coins for five in a row, followed by the Butterfly and Dragonfly which are both worth up to 150 coins. The usual playing card symbols pay anything from 8 coins to 80 coins for five in a row. Angel Princess looks polished and professional, but the pastel colours and general fairy-tale theme with a soundtrack that is a perfect match for the visuals – dreamy and whimsical, adding up to a relaxing and enchanting experience. It’s all very tranquil and enjoyable, which somewhat contradicts the action which is pretty heavy when things hit high-gear. There’s no denying the appeal of Angel Princess, which is another impressive outing from the team at Blueprint Gaming. Beneath its inviting and unassuming exterior lies one serious online gaming experience, with huge prizes to be won and more than its fair share of features.